To motor or not to motor? That is the question! Have you ever been to a polo match? They can be awesome if it is your first attendance. I experienced my first when I lived in Tennessee. It was an exclusive invite, which is rare in those circles. 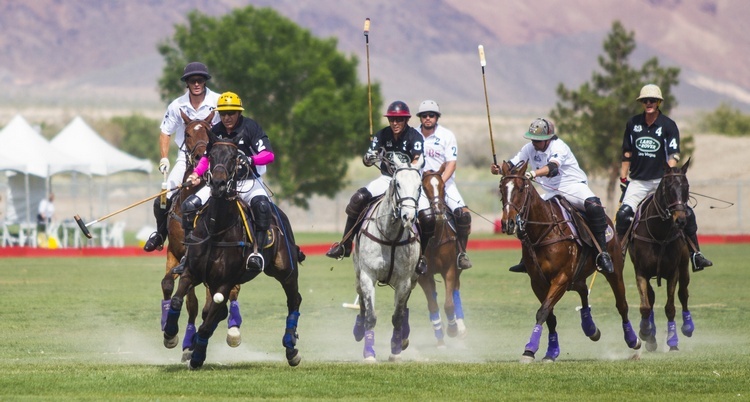 Now, you can experience it at Star Nursery Field at Sam Boyd Stadium in Henderson during the Las Vegas Polo Classic. Polo matches are traditionally the dressiest of sporting events held outdoors, and you can thank the movie Pretty Woman for additional advertising of their heritage. There will be a half-time type break so you can stomp on the divots created by the horse hooves. They will include a best-dressed couple and a hat contest for the over-achievers. There will be gourmet food and drinks and a fashion show presented by Saks Fifth Avenue. The event takes place Saturday and Sunday, April 13th and 14th from 3:30 p.m. until the gates close at 8:30 p.m. There is one match each day, with the rest of the day filled with access to the Polo Village where you can purchase that expensive jewelry, watches and a private jet, if you are so inclined and have the financial resources. During the day, there will also be a trophy presentation, a concert by Wolf Creek and a hot air balloon glow at 7 p.m. The following prices are for each day of the tournament. There will be different table seating areas, including the Billionaire’s Row tables (tents) for $1,500 and the Millionaire’s Row tables (tents) for $1,000. These are front seat, VIP tailgating tents, which include gourmet baskets and wine and are located on the north side of the field. Both accommodate 10 people, with the Billionaire’s tents including an additional gourmet basket, ceiling fan, chiffon drapes, and special table settings. Also included are tickets to the cocktail receptions on April 11th at Saks and April 12th at Wynn Las Vegas. On the south side of the field, the open seating is under the Umbrella tables, which are $50 and do not include food or drinks. You can purchase these separately. Do you enjoy bicycle riding? I mean, the non-motorized, pedal-pusher bikes? 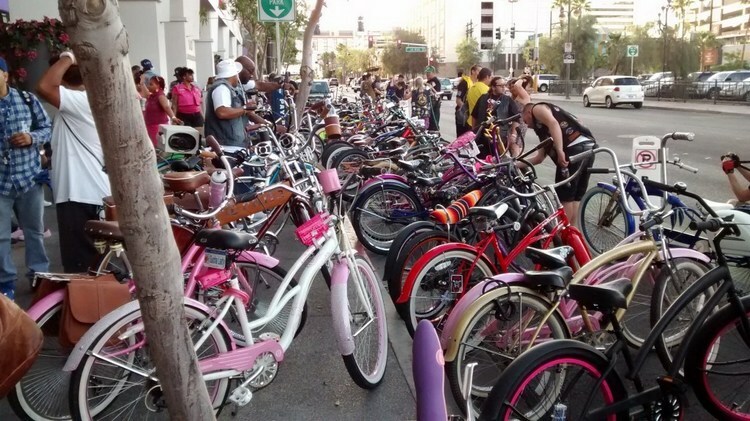 Well, the Golden Nugget Hotel is hosting Bike Jam from the Outlaw Bicycle Club. This event is held April 3rd through 8th (Wednesday through Monday) and is their 7th year of bike riding all over town. There will be hundreds of biking fanatics on the roads wearing their member jackets. There are no contests or races, just a lot of custom bike enthusiasts from across the country getting together to enjoy nature, while visiting a lot of bars and participating in event rides. There will be a happy hour each evening at The Launchpad, which is located across from the Golden Nugget Hotel and is the centralized starting point for gathering for the rides. Several rides can take you down Industrial Road to the CruiserCon Bicycle Show & Expo, or to Pawn Stars Plaza, or down The Strip, or to The Bunkhouse, and even includes a 2 a.m. ride. Registration is $81.32 (includes fees) and includes all the rides, parties, events and a bag with a shirt, stickers and patches plus other goodies. And don’t forget the exercise benefit for your body. Is that worth $81.32? 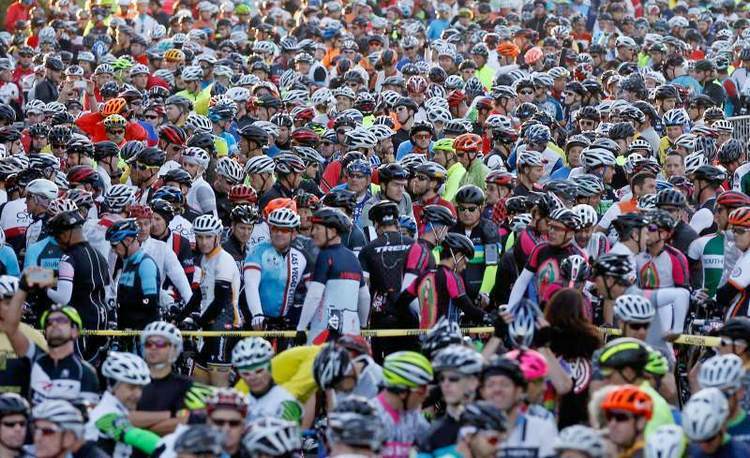 During Bike Jam, Gran Fondo Las Vegas, along with Mini Fondo, will be held on Saturday, April 6th. This is for serious, experienced riders, with the shortest distance a 44 mile trek (Mini) and the longest, for this year, 76 miles (Gran). Because of Hwy. 160 construction this year the Ultimo Fondo of 100 miles has been cancelled. This is a timed event rather than an actual race. Start time is 6:45 a.m. with a close at 4 p.m. The event begins at Las Vegas Cyclery at 10575 Discovery Drive, which is by South Town Center Drive and Interstate 215 in Summerlin. Both the Mini and the Gran events head north to Charleston (Route 159) and west to the Red Rock Canyon area to Blue Diamond Rd. (Route 160). The Gran event will continue up to Mt. Potosi before returning. So, beautiful scenery all the way with a climb to 5,500 ft. The Mini will stop at Blue Diamond Road. and return back to the starting point, which is a 2,800 ft. climb. There are water, food and snack stations along the way, along with assistance for unexpected issues with the bikes and riders. You can volunteer for the event or register at the last minute for a $60 fee for the Mini or $80 for the Gran. 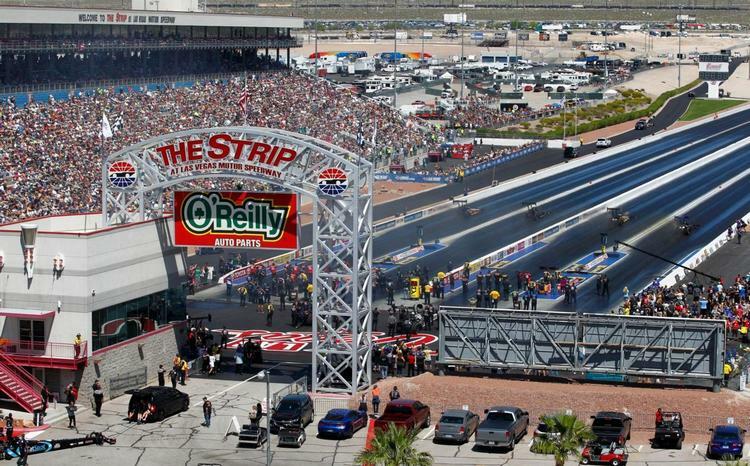 If you are into Jet Dragsters, Funny Cars, Pro Stock Car, Motorcycles, and Four-Wide Drag Racing, the Denso Spark Plugs NHRA Nationals will be held April 4th through 7th at the Las Vegas Motor Speedway. Thursday, April 4th will be the NHRA Fan Fest, with an autograph session from 6 to 8 p.m. on The Brooklyn Bridge outside of New York/New York. Friday through Saturday, the gates at the Speedway will open at 7 a.m., with qualifying beginning at 8 a.m. and eliminations until 7:30 p.m. Semi-finals and finals are on Sunday through 3:30 p.m.
All tickets are being advertised as pit passes. You can walk around and watch the mechanics and get up close and personal with the vehicles. All 3-day Reserved Seating package tickets are $139 for adults. (Prices for the Reserved Seating package for children 12 years and younger were not available at the time of this article.) The 3-day General Admission for adults is $107 and includes free tickets for up to four children 12 years and younger with an adult purchase! The Single Day tickets are $47 for Reserved Adult Grandstand for Friday, $67 for Saturday and $71 for Sunday. Daily Adult General Admission tickets are $10 less for each day, based on the above prices. There is also a Club Nitro Spring Platinum Package available for $469 for adults which includes a seat in the covered section of the grandstands, just below the suites. You will receive a hot meal along with access to the hospitality tent and a VIP parking pass for all three days. Continental breakfast will be included on Saturday and Sunday , and you will receive all the beer, wine and non-alcoholic beverages you can drink. The Spring display at the Belaggio Conservatory is running through June 15. Each season, the horticulturalists and designers team transform the magnificent 14,000-square-foot floral display into a themed showcase. When a season turns, the garden changes and 90 percent of the trees, flowers and plants in the conservatory are recycled. 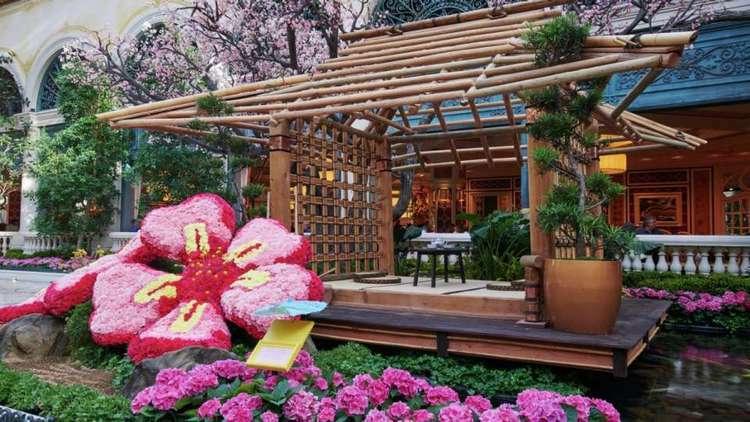 The 2019 Spring Show is highlighting the beauty of spring in Japan. Guests step through two large two large torii gates. The East Bed features a row of cherry blossoms representing the beauty and brevity of life. The North Bed has two red-crowned Japanese cranes designed after the famous Japanese painting, 100 Fountain Views of Edo — Hiroshige Cranes 1857. The West Bed has a towering replica of the Osaka Castle, which is one of the most iconic and historic castles in all of Japan. It has been chosen to host the 2025 World Expo, with MGM Resorts Japan as a supporting partner. GapX The Band and The Dazz Band will bring rhythm, funk and R&B hits to the Access Showroom at Aliante on Saturday, April 13 at 8 p.m. Tickets start at $35. Rhythm and funk tribute band GapX The Band performs impressive renditions of the original The Gap Band’s top hits, including “Outstanding,” “You Dropped a Bomb on Me,” “Early in the Morning,” “Yearning for Your Love” and more. The Dazz Band was the first R&B group from Cleveland, Ohio, to win a Grammy Award for Best Performance by a Group or Duo for their hit song “Let it Whip” in 1982. 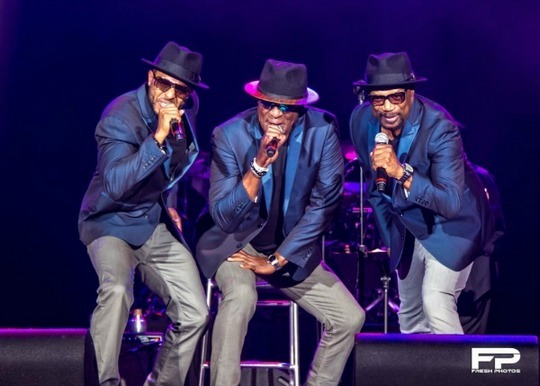 Throughout the group’s career, The Dazz Band has scored 20 hits on the Top-100 R&B charts between 1980-1998, and performed on popular music television shows, including “Soul Train,” “Solid Gold” and “American Bandstand.” The group’s lineup includes Skip Martin, Bobby Harris and Donny Sykes. The Burlesque Hall of Fame (BHoF) is celebrating the first anniversary of its new museum on Main Street with a burlesque benefit show “Anniversa-Tease!” on Friday, April 12 at Ron DeCar’s Event Center at 1201 Las Vegas Boulevard South. Dinner is at 5:30 p.m. with the show at 7 p.m.
Dinner tickets are $49 VIP Plated / $39 VIP and $29 for General Admission. The burlesque talent lineup includes: Bettina May, “The Pinup You Want to Pin Down;” Charlie Starling, “The British Bird Ahead of the Curve;” Cora Vette, “The Mouth of a Sailor, the Voice of an Angel;” Darby Fox, “The Voluptuous Vulpine;” Egypt Blaque Knyle, “The Black Siren;” La Rosa Muerta, “The Spanish Rose That Will Knock You Dead;” and Ms. Tickle, costumer and BHoF title-holder. BHoF located at 1027 S Main St, #110 is open Tuesday–Saturday, 10 a.m.-6 p.m., and Sunday noon-4 p.m. Admission is $15, $12 with Nevada ID, and $10 for students, military and seniors.